Over 29,000 people from 30 European countries took part in the quiz, organised by the consumer movement, Friends of Glass, who wanted to find out about taste preferences and how these are affected by where we live. Of these people, 1,741 were French and 2,907 were British. The quiz, which ran over a six month period on social media, reveals some surprising connections between the British and the French. Although beer was cited by the British as the one drink that reminded them of home, they were more likely than the French to unwind with a glass of sparkling wine on a Friday night. Unexpectedly, the French chose a cocktail as their preferred drink to start the weekend. 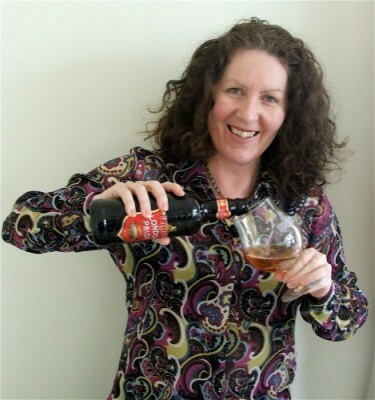 Jane Peyton, beer sommelier and author, who was recruited as one of the ‘European Friends of Glass TasteMakers’* says: “It’s so interesting to consider what tastes we are naturally drawn to and how much where we grow up influences our preferences or in some cases how our tastebuds evolve over time". Whilst one could attribute the sweet tastebuds of the French to their heritage of fine patisserie, it remains a bit of a mystery why the British like bland food. If we point the finger at plain foods such as meat and two veg, we are forgetting the nation’s rich heritage influenced from many other cultures over the years including the nation’s favourite dish - an overtly spicy one too: curry. According to other results of the quiz, when participants were asked what they would be if they were a food, the British chose the classic British dish, sausages and mash, and the French opted for a down-to-earth pasta. Tea remains a staple preferred flavour at the breakfast table in England unlike in France, where they go for coffee. When asked about what they buy in the supermarket, the French are most likely to make a trip for olive oil whereas the British are most likely to buy tomato ketchup. One thing the French and British do have in common is that they both look out for fresh and natural ingredients in the supermarket. Rebecca Cocking from Friends of Glass, says: “What’s intriguing are the questions that the quiz raises about British food culture. British cuisine has historically had bad press on the international stage but we know that British food has changed so much over the years that it is now considered to be on a par with other foodie nations. What’s more, it’s made up of many influences from around the world and is anything but bland". 1. Brits have been smoking foods since the Danes and the Vikings brought us smokingtechniques. Kippers and York Ham are classic examples of smoking today and both areanything but bland. 5. 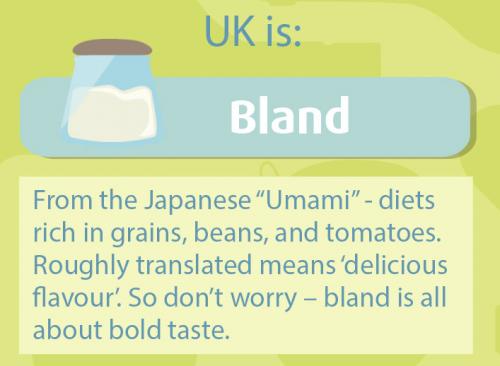 If looking for an origin of ‘bland’, then perhaps the start of bland can be found during the Second World War, when rationing led to food of the most basic ingredients - meat, sugar, butter and eggs - and this continued into the 1950s. It is perhaps from these years that England not only developed a reputation for poor quality food but may also have led to the findings of today’s quiz of the British Bland tastebud…the jury, however, is still out! The overall taste for each country was based on an algorithm that took into account specific answers for subsequent questions. Only questions regarding taste or flavour were given weight in the calculation of the algorithm (for example, questions on shopping habits were a weight of zero in the calculation of taste).